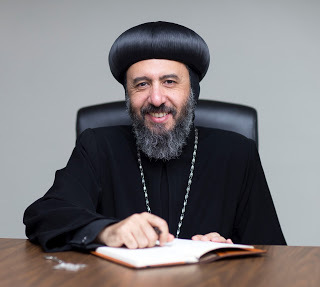 HH Pope Tawadros II, Pope of Alexandria and Patriarch of the See of Saint Mark, and the Holy Synod of the Coptic Orthodox Church, have decided on the establishment of the new Coptic Orthodox Diocese of London, and to entrust HG Bishop Angaelos as the first Diocesan Bishop of London. The Proclamation of this new appointment will be made by His Holiness the Pope and the Holy Synod at a service in Cairo on 11 November 2017. Bishop Angaelos will travel back to England, accompanied by a delegation of Metropolitans and Bishops who will formally enthrone him during a vespers service in the Coptic Cathedral of Saint George at The Coptic Centre later in the month. The Coptic Orthodox Church in the United Kingdom, dates back to 10 August 1954 when it commenced its pastoral and liturgical ministry in London. In February 1969, a historic Liturgy was celebrated in London by the then Bishop Shenouda, the late Pope Shenouda III, who encouraged the faithful to hold regular services, which subsequently led to the hiring of St Andrew’s church in Holborn. Copts would gather from across the United Kingdom to pray there until 1978 when, returning to London as Pope Shenouda III, His Holiness consecrated St Mark church in Kensington as the first Coptic Orthodox parish in Europe. Since then, the Coptic Orthodox Church in the United Kingdom and Republic of Ireland has become an active member of its respective local, regional and national communities, serving in a variety of ways across the four nations, equipping its faithful to be positively contributing and active members in their local settings. At the core of its pastoral care is a focus on Christian education at every level and an active youth ministry. The Coptic Orthodox Church also serves on a wider level through engaging in a variety of benevolent and advocacy related work. The Coptic Orthodox Church in the United Kingdom and the Republic of Ireland now has approximately 20,000 faithful across 32 parishes, with the number of these parishes constantly increasing. These have thus far been served by three dioceses: the diocese of Birmingham, the Midlands and its affiliated regions, served by HG Bishop Missael, the Diocese of Scotland, Ireland and North East England, served by HG Bishop Antony, and the Papal Diocese covering London, the South of England and South Wales, in which HG Bishop Angaelos has served as His Holiness the Pope’s delegate since 1999. His Holiness Pope Tawadros II and the Holy Synod of the Coptic Orthodox Church have now decided to establish the Coptic Orthodox Diocese of London. 0 Comment(s) to the "Bishop Angaelos to be enthroned as first Bishop of new Coptic Orthodox Diocese of London"